Secondary brain cancer. 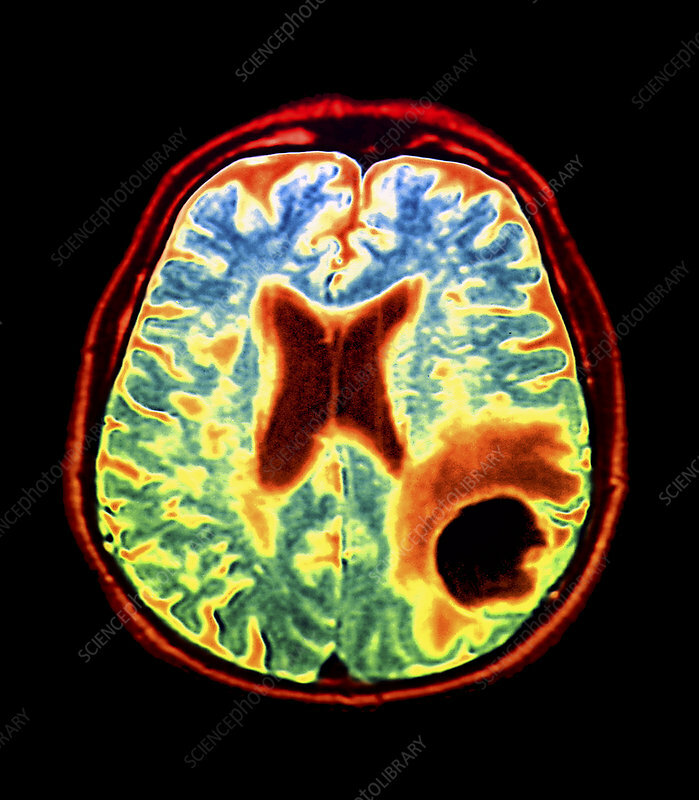 Coloured computed tomography (CT) scan of the brain of a 66 year old patient with secondary brain cancer. A malignant (cancerous) tumour (black) is seen at lower right. This is a secondary cancer as it has metastasised from the site of another cancer. In this case the primary cancer is of the lung. Tumours put pressure on the brain causing a range of symptoms, some of which are dependent on the brain area affected. Symptoms can include headaches, changes in behaviour, seizures and nausea and vomiting. Treatment may be with surgery to remove the tumour, or radiotherapy or immunotherapy to reduce its size.